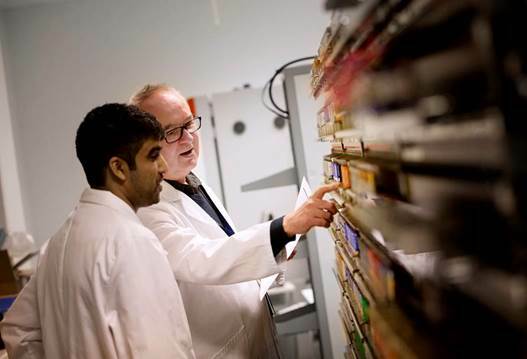 A laboratory test conducted by Testfakta Research has compared the capacity and lifespan of the most common AA batteries on the market. The test shows that the better makes have 20 to 40 per cent more capacity, depending on the application. Most of us have probably experienced the frustration of clicking a wireless mouse only to get no response. Or of seeing the sharp light of an LED torch begin to falter. Quite often the frustration is accompanied by a feeling of resignation when there are no spare batteries left in the drawer. Testfakta Research has tested and compared the lifespan of 23 different makes of alkaline AA batteries purchased from shops in the Nordic market on behalf of manufacturer Duracell. The selection includes both slightly more expensive, better known brands and some of the larger chain stores’ own products. The batteries have been tested in the most common applications, according to a survey carried out by Euromonitor in 2013. These vary from clocks and smoke alarms with low power consumption, to games consoles with medium consumption, and LED torches and electric toothbrushes which use the most power. The clear winner in the test is Duracell Ultra Power which outperforms all of its competitors in four of the five applications. Duracell Plus Power and Varta Max Tech came joint second and were described as having “very good capacity”. “I’m not surprised by the results. Most well-known brands usually perform well, although it can vary from test to test,” says Johny Johnson, technical manager for the battery operation at Intertek – the laboratory that carried out the battery test. Third place went to Aerocell from Lidl which is a good-value battery with very good capacity at medium to high power consumption. “It’s difficult to predict which batteries will perform best in these types of test. There are a lot of factors at play, such as what temperature the batteries are and how new they are, and the batteries can come from different factories even if they’re the same make,” Johnson explains. The two worst performing batteries in the test are Philips Power Alkaline and GP Ultra. They both have poor capacity in devices that consume a lot of power. The other Philips battery, Ultra Alkaline, also rated low in the test, it performed badly in both low and medium-consumption applications. Another battery brand with problems is Panasonic Pro Power, which performed poorly in devices with medium power consumption. The winner, Duracell Ultra Power, lasts for nine hours in a battery-operated toy with medium power consumption, while Panasonic Pro Power (which has the worst capacity in medium-consumption applications) lasts only 5.9 hours. When Intertek tested batteries in the most power-hungry applications, Duracell Ultra Power was 42 per cent better than the worst performing battery. An electric toothbrush lasts more than an hour longer with the winning battery than with the battery at the bottom of the table – GP Ultra. 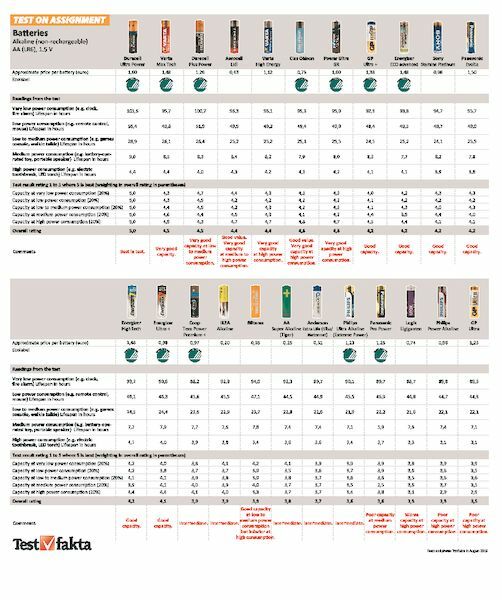 Testfakta Research has tested and compared the capacity of a total of 26 different makes of AA battery (1.5 V) on the Nordic market on behalf of manufacturer Duracell. 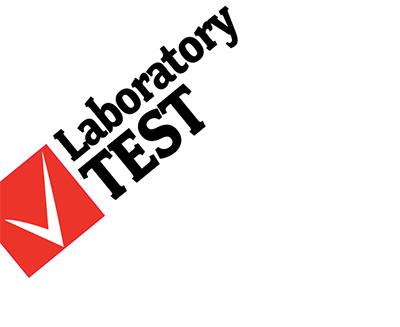 The laboratory test has been carried out by the Swedish technical laboratory Intertek Semko AB. The selection comprises the most common makes of non-rechargeable AA battery sold in supermarkets, discount stores and electronics chains in the Nordic region. The tests have been performed in accordance with standard IEC 60086-2. 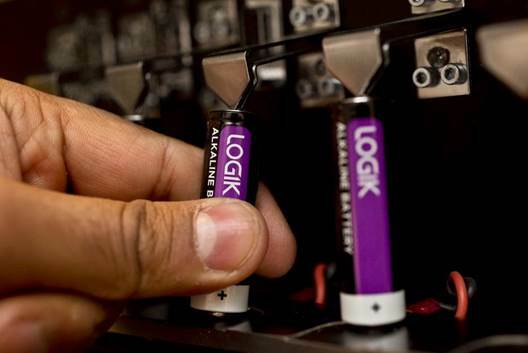 The laboratory has tested the batteries’ lifespan in different applications which place different demands on the battery. For more detailed information about the test, please continue reading here.